Specials weekly/monthly. Corporates most welcome at rates you won't believe ! 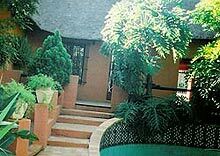 Buonne Notte B&B or self-catering accommodation offers a thatched house, six individual bungalows and a six roomed B&B. Our thatched house has 2/3 bedrooms, two bathrooms, lounge, dinning room and large kitchen. A secluded garden with a lovely pool and braai area. Good security with electronic gates and parking for 2 cars. This house can accommodate a family of 4, or the executive who needs the extra space for his/her office. The second thatch is a large bedsitter (single or double). It has a small lounge area, kitchenette and lovely bathroom. Walk out onto the pool and garden every morning! Electric gates and parking for 2 cars. At our B&B we can offer you 6 large comfortable rooms very elegantly furnished and decorated. Firstly the "Summer Room" This is a unit fit for any VIP. It has an entrance, a study (or second bedroom), a huge gorgeous bedroom with a bathroom that has both shower and bath. The "Winter Room" is spacious and so elegantly furnished, with the second door leading onto the pool and braai area. The "Autumn and Spring Rooms" are just what you need to relax in after a hard days work. Comfort and luxury is the word! Down near the pool are two beautiful luxury rooms. The "Red and Green Rooms". They both have double beds (second bed can easily fit), small lounge area, walk in wardrobe, fridge, microwave and much much more. Lastly, we have 5 fully furnished accommodation units comprising of lounge, dinning room, kitchen, bedroom and bathroom. * Breakfast in our elegant dinning room or on the patio that overlooks the pool area.